Howdy folks! It's Joe yet again with another monthly dose of Legacy content! 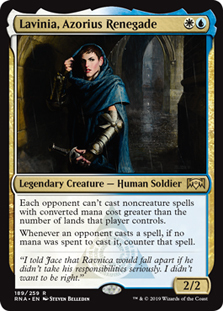 This month we're going to be taking a look at some of the cards coming at us from Ravnica Allegiance as well as some more tips and tricks you can use to develop your Legacy skills. By now, Ravnica Allegiance will be available and there are some sweet cards to talk about here. Right off the bat, let's talk about one of the more controversial ones. When Lavinia was first spoiled, a lot of people relatively overhyped her potential. The card is certainly interesting, and I think the place it will find home the most is in the "Power Rangers" deck (Legacy Humans) because of its creature type, but I don't think it finds much more play beyond that. For starters, Lavinia feels fairly medium in other decks in the format (such as UW Miracles sideboards, Stoneblade, etc) because she often feels a little too slow and ineffective. Many tout the idea that she shuts off cards like Force of Will or Daze's alternate costs, but we often tend to forget that in fair mirror matches like that, those cards are often cut for more proactive countermagic like Spell Pierce or Flusterstorm that aren't land/card-disadvantaging themselves. In theory yes, Lavinia does hate out Storm combo decks, but in practice it's just yet another line of hatebear effects that Storm has to deal with in order to combo off. Whether you are able to apply a consistent clock in addition to Lavinia is the real question. Hatebear decks might pick her up as an option, but I suspect she may not be good enough since she does nothing to keep Storm opponents from searching for an answer with cantrips, whereas a card like Ethersworn Canonist keeps them off locating one by slowing their ability to search for it, and Canonist only costs 1W instead of UW. I will be intrigued to see where players may take this card, but I do suspect she will see more play elsewhere. 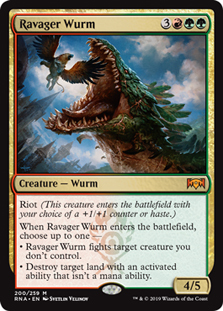 This card amuses me a ton because of the fact that it can be used to cast cards like Hypergenesis in Legacy. That alone is noteworthy. It's definitely going to be a fun card in Modern, I'm sure, but I certainly hope someone throws together a funky Hypergenesis deck in Legacy around it. One nice thing about this card is that you can play Hypergenesis and ditch all the cascade shenanigans and play an actual cantrip shell to find the cards you need for it. This card is very interesting design space, and I don't know that it has a home (some have suggested a take on Manaless Dredge since it's blue and can be pitched to Force of Will that also fixes your dredges) but I like the concept of the card and what it can do. It's also worth noting that this can probably make the cut in Sea Stompy, as noted by a few Redditors. The major reason I mention this particular card is because of my love for Nic Fit. Jund-flavored Nic Fit lists have been for the past year or so playing Regisaur Alpha as a solid way to kill a Jace, the Mind Sculptor that's just been resolved. The issue with Regisaur is obviously despite the fact that it's good at generating an additional body, if they have Swords to Plowshares in hand things get awkward quickly. 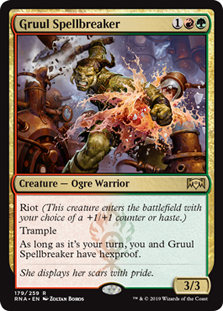 Gruul Spellbreaker solves that by giving a 3/3 for 3 mana with haste and hexproof. I'll definitely be trying this guy out. This is another Nic Fit card I'm interested in looking at because it has the potential upside of killing Gurmag Angler with a +1/+1 counter, or it can blow up a Maze of Ith if need be. Modal creatures are always interesting to me and I won't be surprised to find myself trying this out. 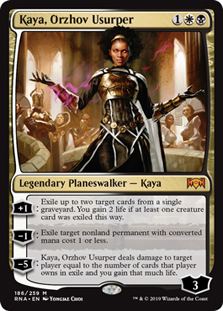 While I think it's great that Wizards is trying different things for Planeswalkers and trying to make them more interesting than the same old "giant threat" level that we've come to expect from them for a while, I don't think Kaya is going to be that great in Legacy. Except for y'know, maybe in that Legacy Soul Sisters deck that Eric Landon 5-0'ed with. Maybe. This card is a strict upgrade over Curse of Death's Hold out of the Nic Fit variant known as Nyx Fit (Academy Rector combo). Super good card to cheat into play. 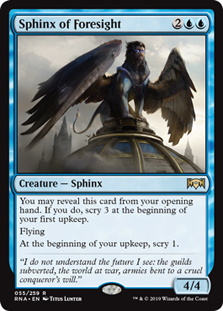 There has been some chatter about this guy solely from the idea that a mono-blue Delver or UR Delver list might benefit from it. 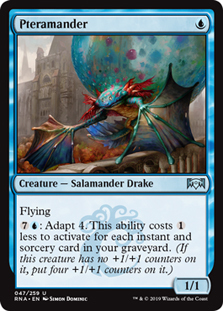 Essentially a flying Gurmag Angler that isn't that hard to activate, given all the instants/sorceries those types of decks actually play. This is a deck style that once played Cryptic Serpent and this is better than that, so who knows. He's just a happy (giant) boy trying to find his little brother. Can't fault him for that, now can we? Now that we've gotten a chance to look a little at Ravnica Allegiance, let's talk about some more fun tips and tricks you can do in Legacy. This time, we're looking at interactions such as Thalia, Guardian of Thraben and Engineered Explosives and also Chalice of the Void. Want a Little "Death" With Your "Taxes"? Death and Taxes is by no means an easy deck to pilot in Legacy, its skill level defined by the metagame around it. There are some interesting things to note when playing this deck however. One of the biggest and most obvious parts of piloting a deck like this is learning how to use Aether Vial to great effect. Vial allows most of the deck to operate at instant speed to catch your opponent off-guard. You can respond to all sorts of things, but it's always very amusing to respond to things such as Cascade or Miracles triggers. Taxing effects like Thalia can sometimes be the brutal in these regards if the opponent can't afford to pay the extra mana for the tax. In addition, sideboard hate bears like Ethersworn Canonist can really ruin Cascade and Snapcaster Mage because it won't allow the second spell to be cast. Aether Vial also lets you perform some tricks to save your own creatures, such as Thalia, Guardian of Thraben. 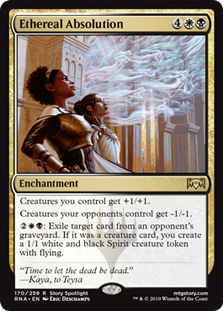 One common line might be to use Karakas to save your Thalia, but what if your opponent has a spell that blows up the Vial in response to the Karakas activation? Well, one thing you can do here is activate Aether Vial, hold priority and then in response activate Karakas on Thalia. At this point, even if they blow up the Vial, you will still get to put Thalia back into your hand and then back into play with the Vial activation. This is because Aether Vial will look backwards in time to see how many charge counters were on it before it left the battlefield to determine what you are allowed to put into play. One of the more interesting cards in DnT lists is Umezawa's Jitte. This card is very powerful and can be often used to perform some nifty little tricks. For instance, if you are facing down an Ensnaring Bridge and your opponent has just enough cards in hand to use Jitte to -1/-1 your own creature to go under the Bridge, then use the +2/+2 ability to pump the creature after declaring attackers. Flickerwisp an opponent's permanent (such as a land) during your end step so that it doesn't return to play until your opponent's end step. This can be useful in removing threats during your opponent's turn. Flickerwisp your own Flickerwisp for sheer value and the ability to do the above trick without the need for a Vial. Flickerwisp targeting permanents such as Chalice of the Void or Endless One means those permanents return to the battlefield with zero counters on them. The applications for this are endless. Flickerwisp can deal with problem auras—like Utopia Sprawl in Enchantress—by flickering the permanent that the aura is enchanting, causing it to fall off. Engineered Explosives is an interesting card with some cool interactions. There is a lot you can actually do to manipulate Sunburst as a mechanice. The way that Sunburst functions is that it cares solely about the colors of mana spent to cast the spell — the more different colors of mana, the more charge counters (or +1/+1 counters if the sunburst spell is an artifact creature) enters the battlefield with. Some of the best interactions come from Chalice of the Void or Thalia, Guardian of Thraben. For instance, you can cast Explosives for X=2 and pay only colorless mana, thereby netting an Explosives with zero counters on it in order to get around a potential Chalice on zero. 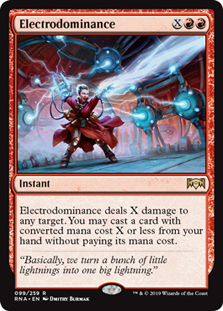 In addition, because Thalia taxes the spell you can declare X at 1 less than the number you actually want to cast Explosives on, and pay the appropriate colors of mana to get the appropriate number of charge counters. (For example: if you want Explosives on two counters, you can declare it at X=1 and pay one color of mana for the cost and another color for the Thalia tax to get an Explosives with two counters) This makes Explosives very versatile in this regard, but it also makes it interesting to figure out the math. Just so long as you are ensuring that the correct number of colors are paid, you can pretty much declare X at whatever you desire. That's all the time we've got for this month folks! Next month we're going to continue our talk about various Legacy decks and the tiny tips and tricks you can eke out of them, focusing primarily on cards like Stifle and graveyard-related decks like Dredge and Reanimator. Until next time, keep playing more Legacy!